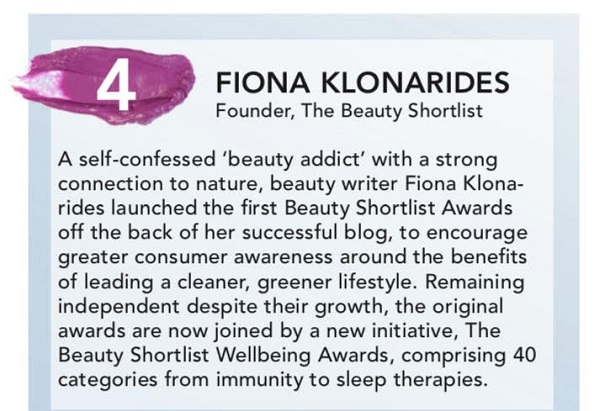 It’s the much-anticipated new Top 25 list of brand founders, distributors, journalists and retailers fuelling the green beauty industry onward and upward – at a very healthy pace, lately! Here’s who made it on to this year’s list – congratulations, all! Thank you (very much) for voting me into the No. 4 slot. Voting is from industry insiders, it’s not a public vote. There’s more on this year’s “Beauty VIPs” list and you can read the write-ups on everyone on it in the brand new autumn issue of Natural Beauty News magazine. “This year’s Who’s Who is proof of a solidarity I witness every day in our industry—a shared vision for beauty which is being championed by pioneers and newcomers alike,” said Natural Beauty News editor Rosie Greenaway.